« Just a Reminder: Valentine’s Day is Just Around the Corner! Discovering the Outdoors … in Winter! Our guests at Brewster House Bed & Breakfast are quite familiar with L.L. Bean’s 5 stores and world headquarters in Freeport Maine. Many even enjoy the L.L. Bean Outdoor Discovery Schools during the Spring and Summer months (in the fall, they’re usually too busy looking at our fall foliage!). But did you know that the Outdoor Discovery Schools in Freeport run in the winter, too? No, not for kayaking, stand-up paddleboarding, shooting clays, etc. But for snowshoeing and cross-country skiing! What? You’ve never tried these great winter activities? Well, now is your chance! The Outdoor Discovery School classes in Freeport run through March 10, conditions permitting (only on weekends, but weekdays, too, from February 18-22). You can snowshoe in the mornings and cross-country ski in the afternoons. They are priced at $20 per person per class, and all equipment is provided! What a deal! Check it out at the Outdoor Discovery School counter inside the Flagship Store, at the door by the boot! 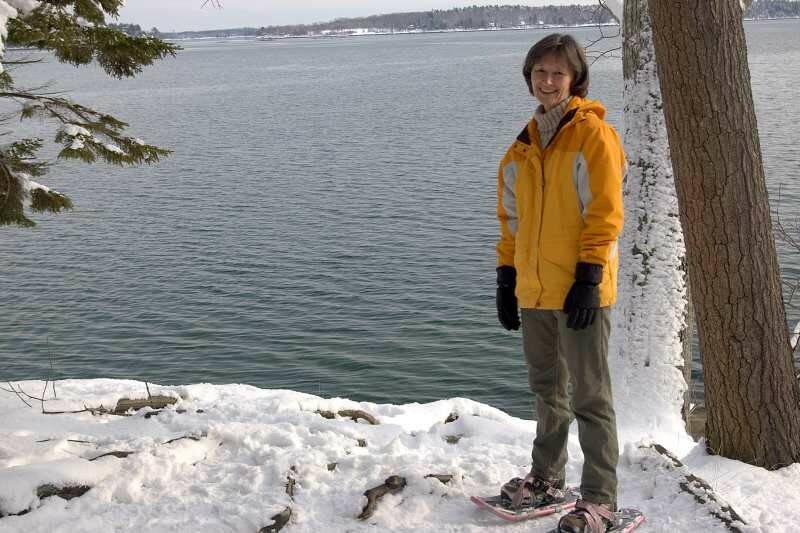 We got snowshoes not long after we came to Brewster House, and while the photo above is not from an L.L. 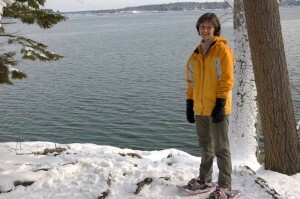 Bean course, it shows Ruth snowshoeing in nearby Wolfe Neck Woods State Park, along the Casco Bay. Fantastic time you had. You surely enjoyed it.